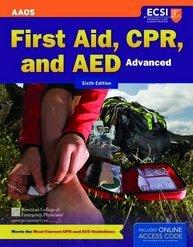 This manual is developed for use within advanced first aid, CPR, and AED training courses offered through the Emergency Care & Safety Institute. The access code also provides access to JBTest Prep: First Aid, CPR, and AED Success, a dynamic program designed to help prepare students for course exams. The self-study modules offer case-based questions and detailed rationales to help students hone their knowledge of the subject matter. Interested in learning more? Visit our Navigate website.